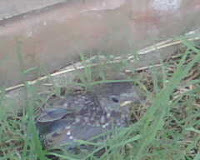 Saturday when Mike was mowing his yard, he found a baby bird. We couldn’t do much with it since you aren’t supposed to touch them so we just left him hanging out in the shade. Then, when we got home Saturday night, Mike found 2 frogs! So, none of the animals were really “saved” but still our world is clearly full of all kinds of fun creatures! I saved a turtle the other day, while talking to Lindsey on the phone and driving! Talk about multi-tasking! However, I DID stop the car to save the turtle.